Travel and Tourism continues to be one of the world’s largest industries. The total impact of the industry means that in 2011 alone it contributed 9% of the global GDP of over U trillion and accounted for 255million jobs substantially more than the automotive manufacturing, mining industries, and the financial services sectors all combined together. Given the labour intensity involved, travel and tourism is projected to be a very big driver of jobs and economic growth and over the next ten (10) years, this industry is expected to grow by an average of 4% annually, taking it to 10% of global GDP or Some U trillion. By 2022, it is anticipated that it will account for 328million jobs or 1 in every 10 jobs on the planet. Despite political upheavals in certain regions, and a global economic uncertainty, the sector remains an assured stabilizing force, generating prosperity and facilitating international trade and investment. At time when more and more people recognize that Africa is the opportunity continent of the future in many aspects, in respect to tourism, the continent’s performance which stands at 4% globally is far below considering its potential and massive opportunities presented by its vast natural wildlife, and cultural resources. Rhimbo Tours & Travel Services (RTTS) comes to operate within the Continent’s action-plan whose overall aim is to make “AFRICA”the 21st century destination. Today, the agency operates in Uganda, Kenya, Seychelles, and Tanzania. Because of its abundant natural gifts, a number of international travel guides like "Lonely Planet", "Birdlife International", "Africa Bird Club", "National Geographic" have named Uganda as the best (or preferred) destination. With it’s 34 bird watching areas, and over 1,065 bird species, Uganda has recently been declared a preferred and a must destination for bird watchers. The rich bird diversity accounts for 10% of the world’s total bird species, and 50% of Africa bird species population. This means that by visiting Uganda, a tourist would be able to see half of the bird species of the entire continent. 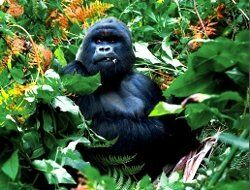 Besides this, Mgahinga and Bwindi Impenetrable National Parks are home to half of the mountain gorillas of the World. Other Parks include Queen Elizabeth National Park, Kidepo National Park, Mount Elgon National Park, Lake Mburo National Park, Kibale Forest National Park, Semliki National Park. Whether you’re looking for a hotel, lodge, cosy cottages luxury tented camp or exclusive retreat, Uganda has them all. No matter what type of holiday you’re looking for: Uganda offers many styles of accommodation whether it’s a 5 star sophistication, or a remote wilderness hideaway, the information you need is right here for you to choose what suits your purse and your style best. Rhimbo Tours & Travel Services is privileged to be an affiliate of Hostelworld.com, rated by 2012 travel surveys as the most trusted hostel website of the year. Hostelworld.com brings you online bookings at thousands of hostels worldwide. Check out our up to the minute hostel reviews, view photographs and read detailed descriptions at all our hostels. Select and confirm your reservation at any of our youth hostels, independent hostels and international hostels in Europe, Asia, Africa, North America, South America and Oceania. Book with us now and start your adventure as you discover our great deals, beds and breakfasts, airport connections, and many more. To make your booking, please click into the banner on the right side here.